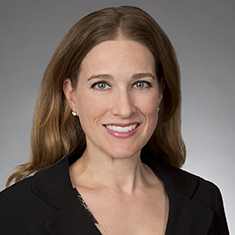 A seasoned transactional lawyer, Mara Glaser McCahan works on a range of deals in both regulated and unregulated industries. Her broad experience makes her a creative problem solver, applying best practices and techniques from transactions in a range of industries while staying attuned to the specific nuances of each industry and deal. Mara represents banks, private equity funds and other business enterprises ranging from emerging growth companies to established multibillion-dollar public companies. She often acts as outside general counsel to her clients and is known for her business acumen and technical savvy. Mara concentrates her practice on complex corporate transactions, including mergers and acquisitions, joint ventures, debt and equity financings, as well as general corporate matters. She has done substantial work in the distressed company and restructuring arenas, including Section 363 asset sales. In addition, Mara focuses on the highly specialized area of guaranteed and unguaranteed tax credit investment funds, working closely with the Katten's Transactional Tax Planning practice in representing these highly tax-sensitive investment vehicles. Mara's clients range from companies in real estate to technology and from fintech to manufacturing. She has particular depth of experience in regulated industries, including banking, insurance, and telecommunications. Shown below is a selection of Mara’s engagements. Representation of a financial institution and savings bank subsidiary in connection with the $42.5 million acquisition of a tax-related financial solutions provider. Representation of a national bank in its acquisition of a registered broker-dealer. Representation of the lead seller of one of the largest retail optical chains in an auction process that resulted in the $305 million sale by merger to one of the top US health insurers. Representation of a financial institution and savings bank subsidiary in connection with its acquisition of a consumer tax advance and credit services company. Representation of a financial institution and related savings bank in connection with the $51 million acquisition of substantially all of the assets and liabilities of a provider of federal and state tax refund products and services to tax preparers and consumers throughout the United States. Representation of a savings bank in connection with its $77 million acquisition of substantially all of the loan portfolio and related assets of a leading commercial insurance premium financing company. Representation of an industry-leading real estate company in its stock acquisition of a residential mortgage and title insurance company. Representation of a specialty sporting goods company in its sale to a private equity fund. Representation of a private equity fund in its acquisitions of various portfolio companies, as well as numerous debt and equity investments. Representation of a provider of a wide variety of telecommunications services, including local exchange, long distance and data services, in its $122.5 million sale to a global media and technology company. Representation of a private equity investment firm in a variety of acquisitions, including its $65.5 million merger acquisition of a magazine and marketing fulfillment services company and its $100 million merger acquisition of industrial cleaning product companies, along with the associated management roll-overs and employment arrangements. Representation of government contractors (affiliated speech translation companies) in the sale of their technology, IP and other assets to a multibillion-dollar defense contractor. Representation of a government contractor in a variety of acquisitions, including its stock purchase of a Canadian surveillance technology and data processing company; its acquisition of substantially all the assets of a provider of secure access technology for voice and data networks; and its stock acquisition of a UK encryption and security equipment manufacturer and data security consultant. Representation of a Manhattan real estate developer in connection with its formation of a joint venture to acquire a $100 million apartment building in Manhattan. Representation of various investors and sponsors in connection with joint venture investments for real estate acquisitions in Manhattan. Representation of a personal oncology company in connection with a series of equity financings. Representation of various issuers and investors in private placements of preferred stock offerings, ranging in size from tens of millions to hundreds of millions of dollars. Representation of a REIT and special purpose subsidiary of a national bank in its issuance of $500 million of preferred stock in a private placement. Representation of various issuers and investors in equity and bridge financings of emerging growth companies. Representation of several competitive local exchange carriers in financing arrangements, including a $182 million secured telecommunications equipment financing and a $130 million senior secured credit facility. Representation of a leading real estate investment company in its $41 million investment to partially fund the acquisition of an apartment building in Manhattan. Representation of fund sponsors in connection with the formation of multiple LIHTC and ITC tax credit funds, with fund sizes ranging from $20 million to more than $100 million. Representation of various purchasers (both as “stalking horses” and as bidders) and sellers of assets in Section 363 transactions through the bankruptcy process. Representation of the management team of a provider of secure networking and emanation security products in its successful management buyout of the company in bankruptcy. Representation of an American multinational technology company in its acquisition of certain IP assets of Circuit City in a bankruptcy-governed auction process. Representation of various lenders and debtors in bridge financings of varying sizes. Representation of an ad hoc committee of noteholders in their restructuring of $100 million of defaulted notes issued by a Russian baby food manufacturer. Corporate representation of debtor, an insulation manufacturer, in its 524(g) reorganization of its asbestos liabilities and the 524(g) trustee after confirmation of the plan. Corporate representation of the trustee in connection with a flooring manufacturer debtor’s 524(g) prepackaged plan of reorganization and post-plan confirmation.